1.Russian President and elected autocrat Vladimir Putin announced today that, contrary to expectations, he will not attempt to modify his country's Constitution, which imposes a term limit on the Presidency. So he will be leaving office in 2008, even though he is very popular. Putin's term has been marked by sky-high oil prices, a booming economy, growing presidential control of all of Russia's institutions, a controversial war in Chechnya, hostile attitudes toward weaker neighbors and increasingly heavy-handed restrictions on democratic freedoms. 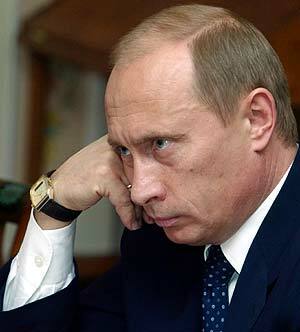 Despite all of this, Putin has decided to show some democratic colors and is stepping down. Let's hope that our own petrocrat follows Putin's lead - that is, if voters decide to give him another term. 2.Leopoldo- Alek Boyd has an interesting interview with Chacao Mayor Leopoldo López, undoubtedly one of the opposition's brightest political stars. I take issue with some of López's positions regarding the Recall Referendum, but the interview is good in that it highlights the fact that the defense of the vote requires such a huge volunteer force, it becomes a task for all of us, not just the politicians. It is up to us to defend our votes. The problem is that the Rosales campaign is not doing a good enough job of convincing people that voting itself will be secret. There is still a lot of fear in the general population about this point, and it should be addressed from now until the end of the campaign. That is, of course, assuming it will be secret, which it will be... right?